Hot Chicks, Cool Dudes: it’s Turtle Season! 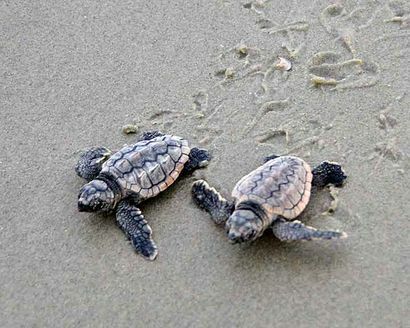 Did you know the temperature of a sea turtle’s nest determines whether the hatchlings will be male or female? A warmer nest produces mostly females, a cooler nest produces mostly males (hence the headline). Leatherback turtle nests are a rare event. If you take your kids for a late-night beach walk while at ‘Tween Waters, you may spy a sea turtle crawling out of the water, or back to sea after laying her eggs. If you do, don’t approach her or shine light in her direction. They spook easily. The best thing to do is quietly admire the glorious gift you’ve been given to witness something so amazing. Fun fact: To lay their eggs, female turtles return to the same beach where they were hatched! Want to help sea turtles? Before leaving the beach, flatten any sand castles, fill in any holes, and remove toys and chairs. These are all obstacles for a crawling turtle or hatchling. You can also check for dangers, like trash or fishing line, and dispose of it properly. Since hatchlings use their instincts to crawl toward moonlight on the water, any other light can be hazardous. At ‘Tween Waters, we do our part by reminding you to keep curtains closed at night, dimming balcony lights, and keeping lights away from the beach. Sea turtle tracks and a marked nest.